Callista is a beautiful Lagoon 620 Essence that offers the best charter layout with a spacious cockpit and the upper flybridge which is perfect for lounging. 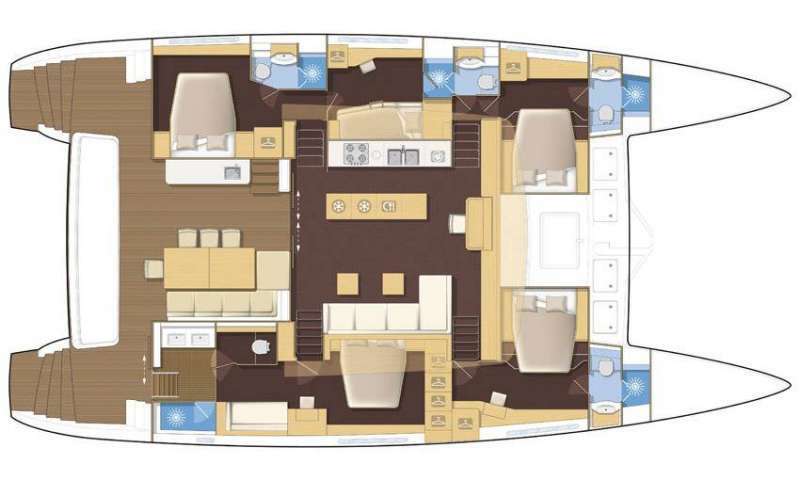 With a galley up design, this yacht features a spacious master stateroom plus three queen en-suite guest staterooms, accommodating a total of 8 guests in addition to her crew. Callista is available for crewed sailing vacations in the Caribbean Virgin Islands spring and winter months, and the Grenadines in the summer. Contact us for rates and current availability or to book a charter aboard Callista! SONOS Music system is available in 4 zones, saloon, cockpit, fly bridge AND fore deck. Listen to different music choices at different volumes in 4 different areas of the yacht. We have a 110V transformer on board. CALLISTA has a medical kit to MCA coding. CALLISTA welcomes tandem charters but for safety reasons no overnight rafting will be possible. Note there is a shade over the foredeck area on CALLISTA. Scuba Terms Guests may bring their own gear or rent from local dive shop (approx $180pp), 3 dives per week for certified divers.